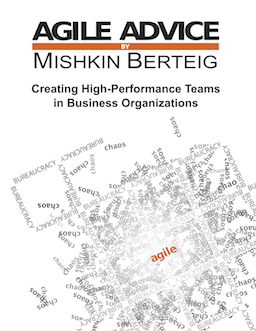 Pete Behrens has a very interesting and relatively new blog called Agile Executive. His recent entries have included thoughts about High Performance Teams, Executive Priorities, and some book reviews. 1. Figure out what is going to deliver value (usually cost savings). In the case of infrastructure projects, one is usually focused on cost savings. Find a way to tie your work items directly to cost savings. You need a good financial model to do this. Mary and Tom Poppendieck talk about this a little in their Lean Software Development book. In the decommissioning program, there was a very explicit dollar cost associated with disk space and cpu utilization. Every user/MB decommissioned saved a measurable amount of money. As well, it allowed us to easily prioritize our backlog. 2. Focus project/program organization more on Lean principles than agile. A good understanding of queuing theory will go a long way to helping with throughput. In a team doing defects/enhancements work, the small pieces lend themselves well to certain types of streaming through the team. Iterations are not necessary to chunck work. Instead, iterations become checkpoints solely for process reflection. 3. Technical infrastructure projects can benefit greatly from automation. Test automation including test generation can sometimes be possible. Automating parts of a regularly repeated process that is used for every work item can be extremely beneficial for increasing speed. In the case of the decommissioning effort where every database table needs to be considered separately and where they all go through the same process for decommisioning, there are many opportunities for automation. The project/program/team can invest in doing this automation to great benefit to NPV. 4. The basic axioms (We are Creators, Reality is Perceived, Change is Natural) and disciplines (Empower the Team, Amplify Learning, Eliminate Waste) still apply. Even though it is not “new” product development, the creativity of people is essential for problem solving, and finding ways to do the work faster. Stakeholders still need to have their perception of reality acknowledged, and the teams still has to do constant checking to make sure they are on track with that perception. And of course, things are always changing including priorities, our understanding of the work, resource availability etc. Having an empowered team makes short work of many obstacles, but that wouldn’t happen without an explicit acknowledgement that we have to constantly be learning and eliminating waste. Teams get better and better at these disciplines over time. I would be very interested to hear other peoples experiences with infractructural/operational projects. One of the things I like about Extreme Programming (XP) is that its advocates gladly share their experiences using it. This sharing contributes in many ways to its increasing value as a project management process. We can all review, comment, and learn from each other. With this end in mind, I offer the following report on an architectural project completed recently using XPM practices. XPM is an acronym for Extreme Project Management, my version of a set of practices based on Extreme Programming. It shows one way XP practices can be adapted to a non-software project. I hope others using or considering similar practices will find this report useful for their own endeavors. Over the course of the past week and a bit, my ISP had a serious outage which prevented this web site and related email addresses from being available. Please accept my appologies. We will resume regular new contributions soon. The Process Facilitator is a person who is both experienced with Agile Work and trained as a facilitator. The Process Facilitator acts as a coach to the team to monitor the process, foster the understanding of the Agile Work Axioms, the development of the Agile Work Disciplines and adherence to the Agile Work practices. The goal of the Process Facilitator is to assist a team to become “performing” so that they are able to actively and independently persue continuous learning and improvement. I have been unable to post to this blog lately due to time spent setting up a new home in Richmond Virginia combined with starting on a new and very large, intense project. I will begin to post again regularly. Sorry to regular readers (I know there are some 🙂 ).